Apply for the Dave Perry College Scholarship today! his week, Illinois Water Polo and the Metro Catholic Aquatic Conference are presenting the Dave Perry College Scholarship Awareness Week. IHSA Water Polo Season Starts Today! 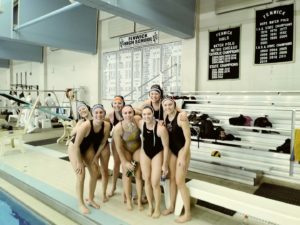 Good luck to all the high school teams participating in the Illinois High School Association’s spring water polo season which starts today. Competitions will begin on Monday, March 4, 2019. The IHSA State Championship Tournament will be held at Stevenson High School on Thursday, May 16, Friday, May 17, and Saturday, May 18, 2019. Two Daves Tournament a success! Perry Korbakis and John Hinkle , Eddie Prysatski , Victor Rarau led over 30 new officials during the 2019 Two Daves Tournament which serves as a training tournament for IHSA water polo officials. If you are interested in becoming an official, please contact Perry Korbakis at pkorbakis@aol.com. There was a large turnout for the January Official Clinic. 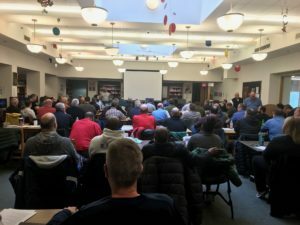 Officials reviewed 2019’s Rule changes. Speakers covered mentoring and the nuances of women’s water polo, specifically suit grabbing. New officials reviewed whistle technique and points of emphasis for their first year officiating water polo. The level two clinic reviewed video showing correct application of the rules in the 2018 State Tournament’s game situations. Illinois Water Polo will hold five meetings in 2019 on the following dates: January 13, March 10, April 14, September 15 and November 17.